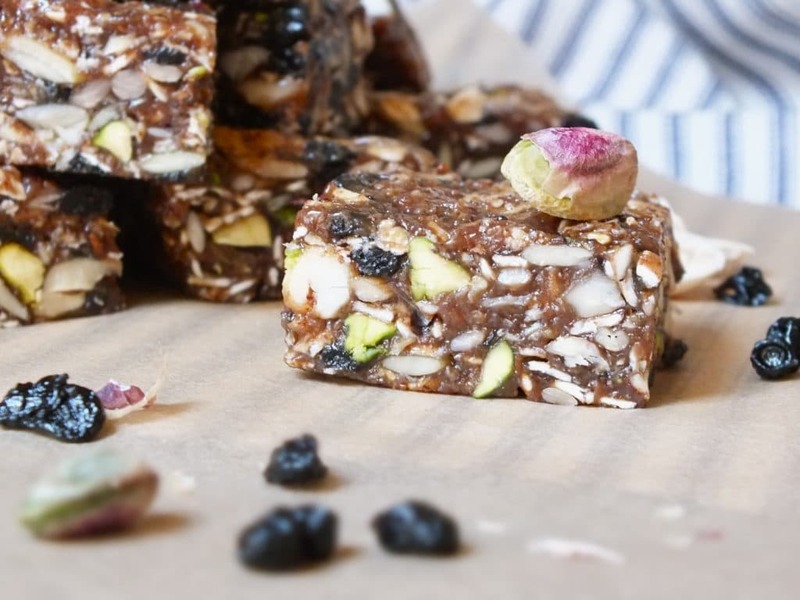 These pretty little bars are like 3-in-1 power nuggets: snack, fuel, and treat. They’re just sweet enough, chewy, crunchy, and filling. Aside from freezer time, this recipe takes only 15-20 minutes to make. Line an 8” x 8” pan with parchment and set aside. 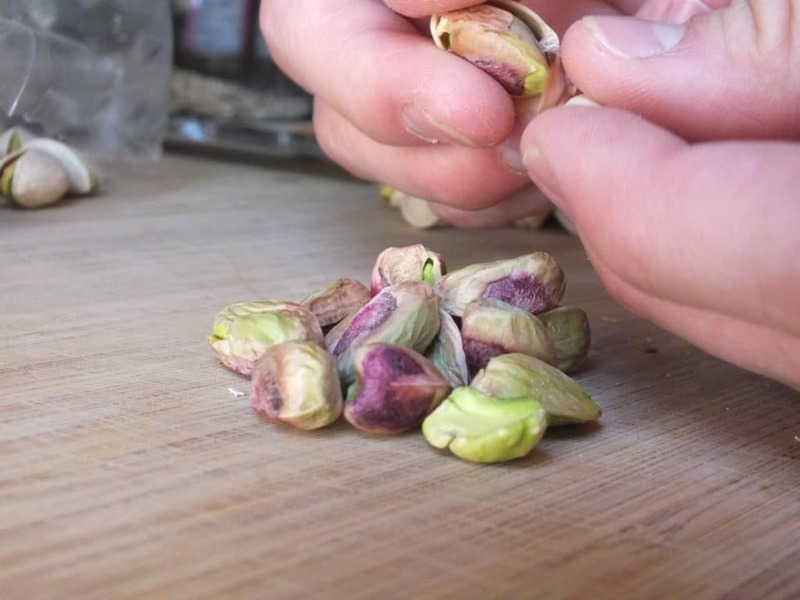 In a medium bowl, combine all of the dry ingredients and mix them together. Add honey and apple sauce and start mixing with a large wooden spoon. 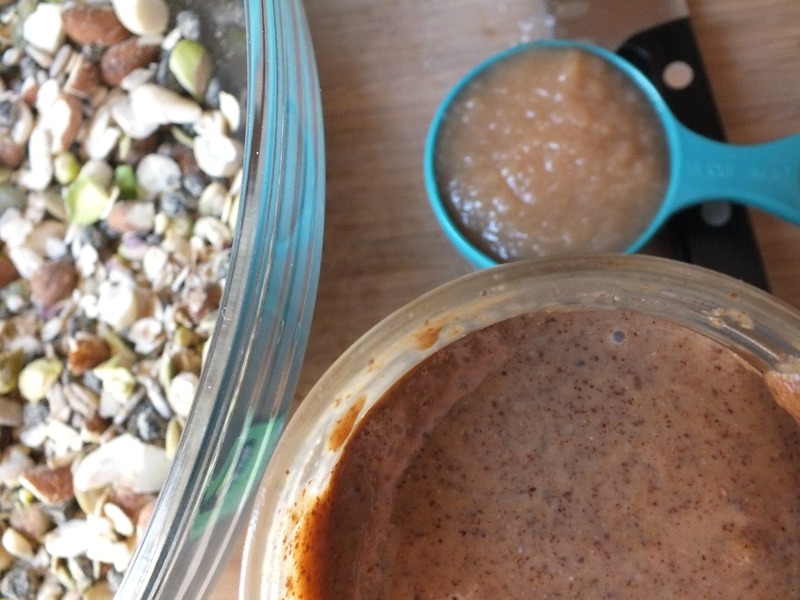 Add almond butter and continue mixing until well combined. You may have to get your hands dirty to make sure it’s well combined! 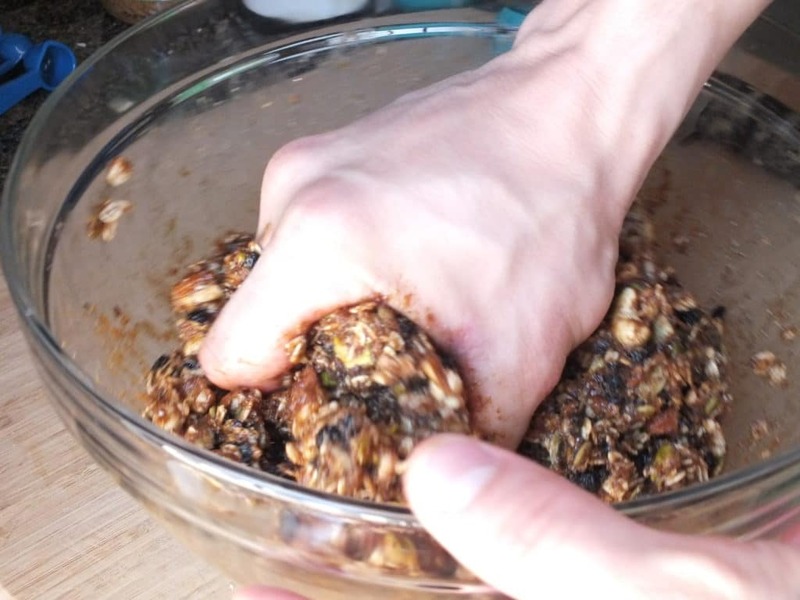 Empty the mixture into the baking pan and press it out using your hands. Pop the pan into the freezer for 1 hour, then remove the slab of bars by lifting the parchment. Cut into squares however large you desire. Store in a bag or glass container in the freezer until you run out! They stay good indefinitely as long as they are well sealed in a freezer bag. 1. Line an 8” x 8” pan with parchment and set aside. 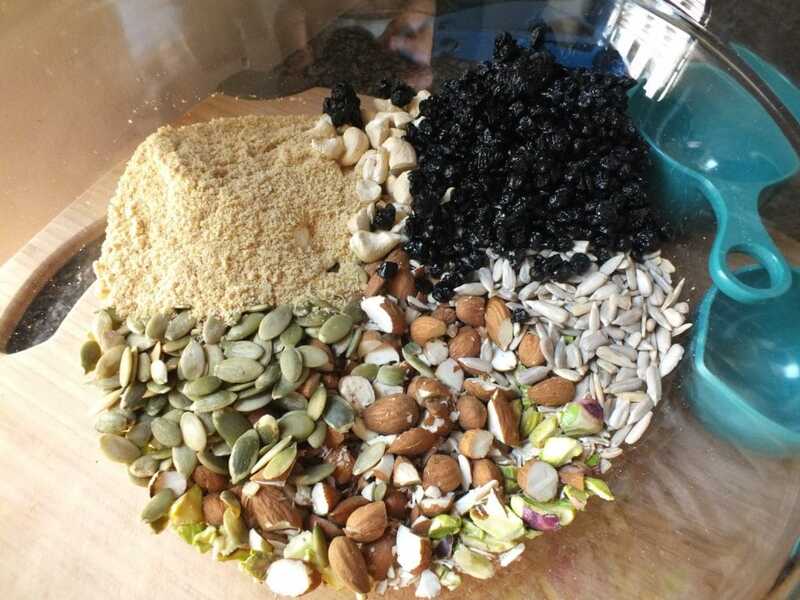 In a medium bowl, combine all of the dry ingredients and mix them together. 2. 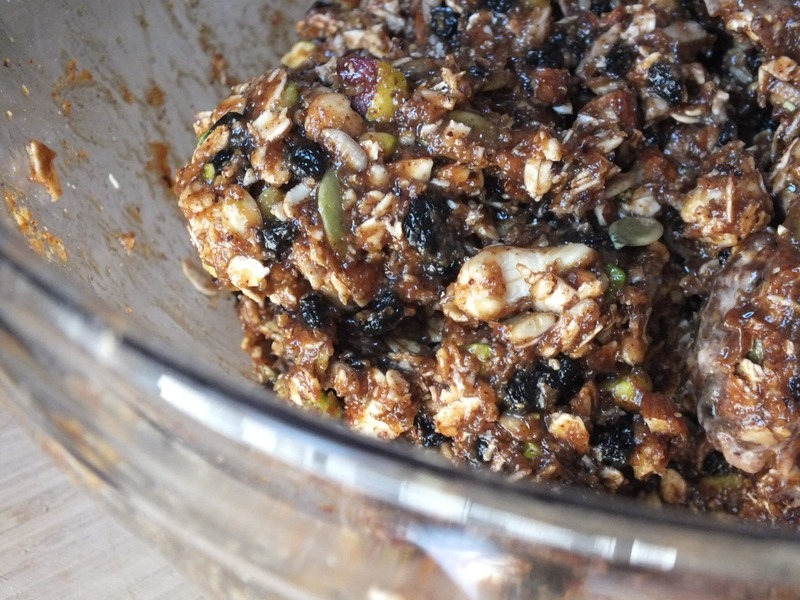 Add honey and apple sauce and start mixing with a large wooden spoon. 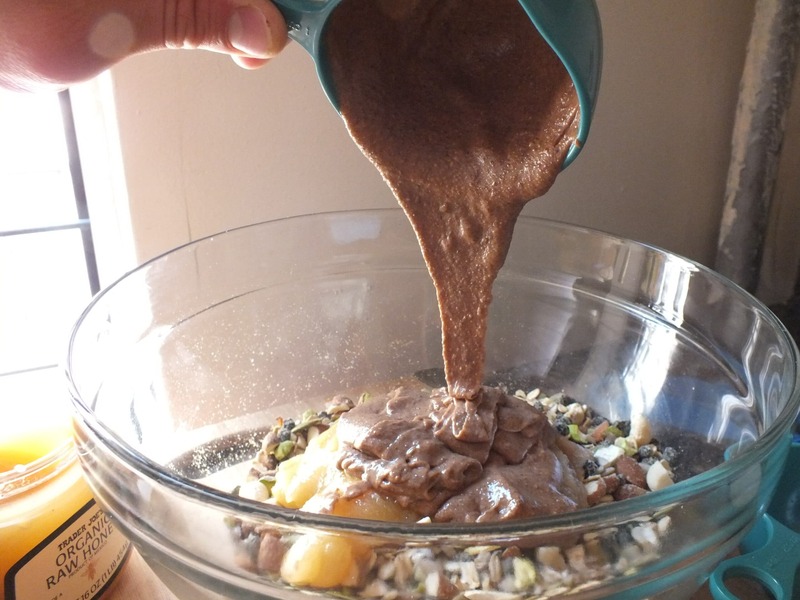 Add almond butter and continue mixing until well combined. 3. You may have to get your hands dirty to make sure it’s well combined! 4. 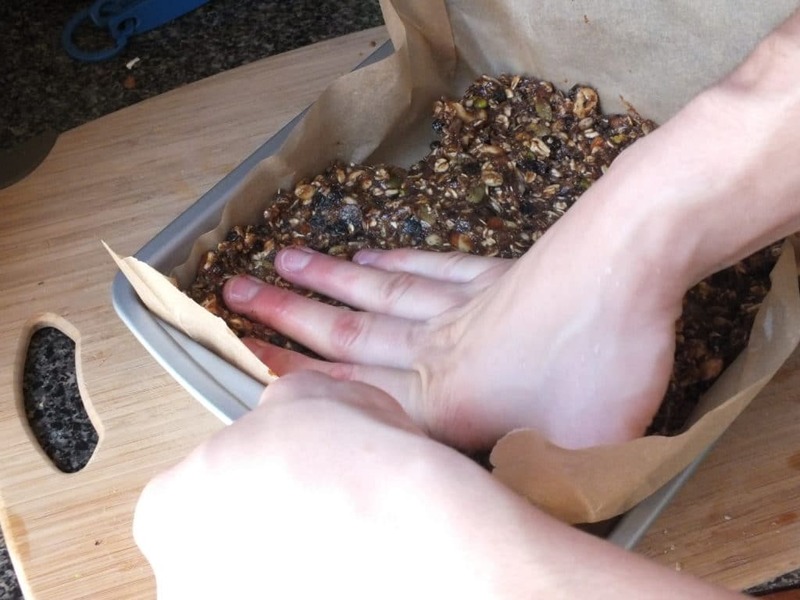 Empty the mixture into the baking pan and press it out using your hands. 5. 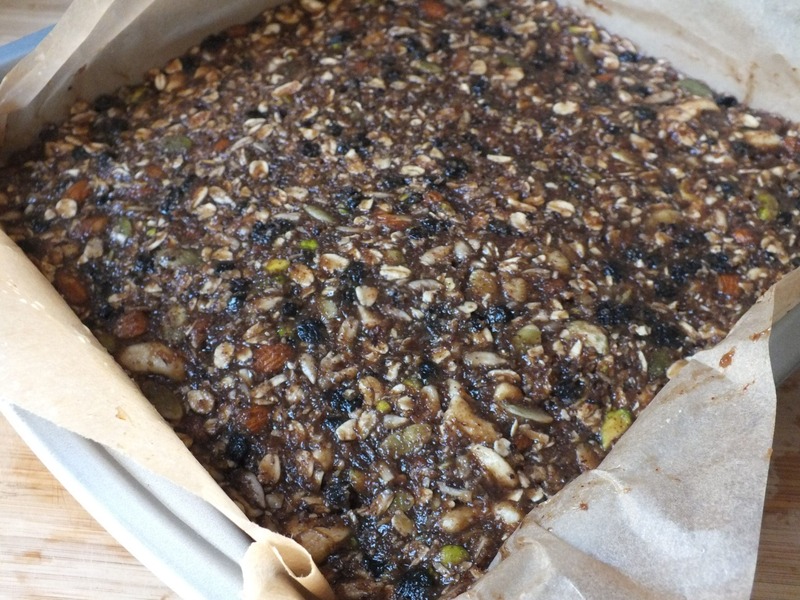 Pop the pan into the freezer for 1 hour, then remove the slab of bars by lifting the parchment. Cut into squares however large you desire. Store in a bag or glass container in the freezer. They stay good indefinitely as long as they are well sealed in a freezer bag. I just had a Raw Bar at Peet’s Coffee in San Francisco airport. I think I have a new addiction; unfortunately, there is no Peet’s where I live. The Raw Bar recipe here sounds like it may be similar. Does anyone know if these 2 bars are similar? How many calories are in a serving (roughly)? You could try a half and half mixture of date paste and almond butter, I don’t see why that wouldn’t work. And yes, you can definitely swap the apple sauce for banana. Enjoy! if its ok not to use honey,beacuse i dont want to use any type of sugar. You could try to substitute honey for applesauce instead. Good luck! and paragraph is actually fruitful designed for me, keep up posting these types of articles. Just made these bars this afternoon. Family loved them. Thank you. One question – they seem to fall apart. Any suggestions? That’s great to hear! Did you give them enough time in the freezer to solidify them a bit more? Also, they must be stored in the freezer. We’re sorry about that! Thank you. I will try that and see if it stay together better. Anyways, it doesn’t really matter as they are so delicious. Can you make these without honey or agave or any other sweetener? Sorry I’m asking again but in order to calculat the weight watcher points I need to know how much fibre is in the bars. Hi Brianna, sorry for the delay! 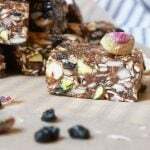 The entire recipe contains 82 grams of fiber, which totals out to slightly over 5 grams per bar [if you cut yours into 16 pieces like we did]. So glad you liked them! 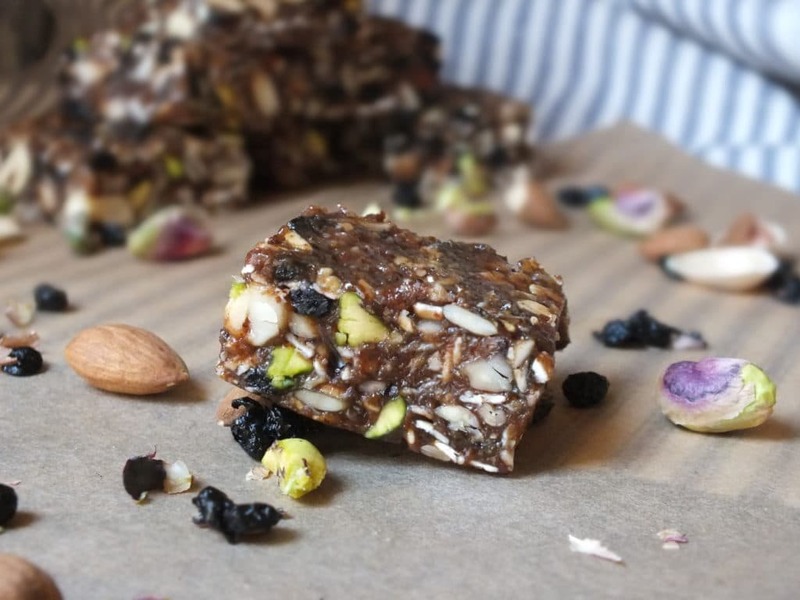 Have you by any chance made these with peanuts & peanut butter instead of almonds? 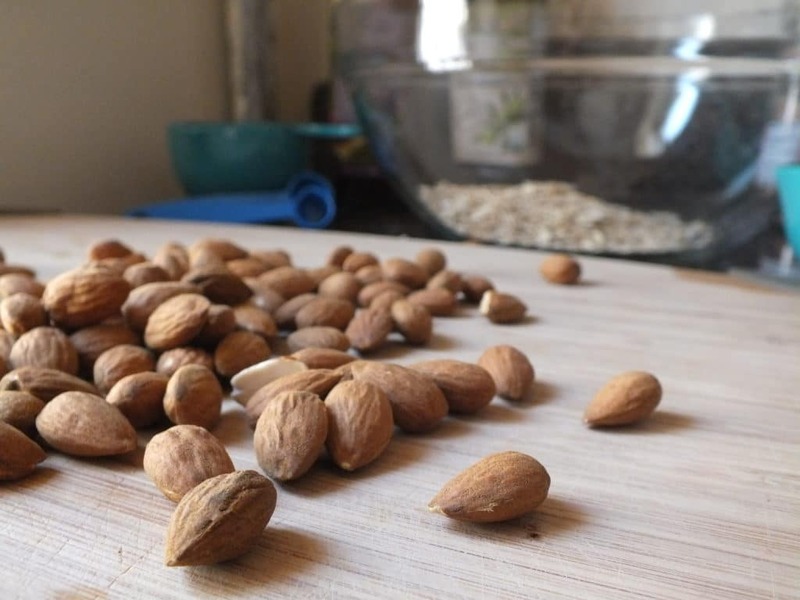 My husband is allergic to all tree nuts (almonds, walnuts, pecans; you know all the good for you ones!) but is not allergic to peanuts. I’m wondering if it would still work and taste ok? Gotta do what ya gotta do, right? We’re so glad you found it too! Don’t hesitate to ask if you have other questions. Enjoy! Thank you for your question! Each bar consists of: 175 Calories, 11g fat, 15g Carbs, 8g Protein, 1g Sodium, and 6g Sugar. If you decide to try them, be sure to come back and let us know how they turn out! I will let you know how they come out. One more question, how about the fibre? Holy smoley… I substituted the oatmeal with oat FIBER (not oat bran) and cut the carbs way down. Taste fantastic! Each bar has 175 calories. And your English is just fine :)!